The campaign launched by Kuwait Diabetes Society (KDS) is a one-stop solution to educate, early spot, and offer full support to help manage the life-changing DPN nerve disease. first in Kuwait to adopt the one-stop solution, part of the campaign activities for diabetics. “Qadam Bela Alam” campaign was derived from the pressing need to tackle DPN as there is approximately 399,000 diabetics in Kuwait and the prevalence of DPN is 39 per cent. 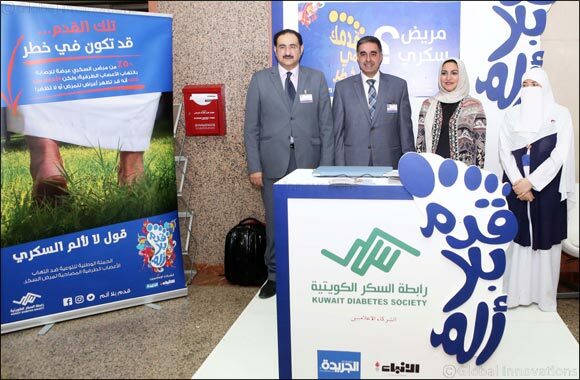 KUWAIT, 1 April 2018: Kuwait Diabetes Society (KDS) launched a hospital outreach program to educate, early spot, and offer full support to help manage diabetes patients suffering form the life-changing condition Diabetic Peripheral Neuropathy (DPN) nerve disease, as a first step in the nationwide “Qadam Bela Alam” Foot without pain campaign in Kuwait. Highly-trained medical staff from the “Qadam Bela Alam” campaign will be stationed at an activation booth at Al Mubarak Hospital, the first hospital to adopt the concept of holistic management of Diabetes starting from educating diabetes patients about the disease and identifying foot complications to conducting foot examination tests and completing a DPN questionnaire to spot DPN patients. “Qadam Bela Alam” campaign emanated from the urgent need to tackle Peripheral Neuropathy nerve disease amongst diabetes patients and make them aware of its foot complications that could have serious consequences without warning symptoms. Peripheral Neuropathy is a nerve damaging condition of the lower limbs that affects more than half of diabetics worldwide and causes an average of 54,000 lower-limb amputations globally every year. With approximately 399,000 diabetics in Kuwait, the prevalence of DPN in the country is 39 per cent. The nationwide campaign stresses on the importance for diabetic patients to understand that diabetic foot problems are often caused by nerve damage and they should visit their doctor regularly for check- ups even if their feet aren’t showing any symptoms. Important to note is that while keeping glucose levels within the normal range is important, it is only one step in the fight against DPN nerve disease. Warning signs and symptoms of DPN nerve damage include tingling, burning or prickling sensations in the limbs, sharp pains or cramps in the legs, extreme sensitivity to touch, and loss of balance. “The steps we take today can protect the future steps, and this is the first important step on that journey. Peripheral Neuropathy is a growing concern affecting patients in Kuwait. Through “Qadam Bela Alam” and the numerous activations, we will emphasize that Peripheral Neuropathy nerve disease is extremely serious for diabetes patients because it can strike at any time, regardless of age, gender or ethnicity, however, it is not inevitable. The campaign will engage with diabetes patients, their families and friends, to educate them on measures they can take to reduce the potential of Peripheral Neuropathy nerve disease, it will show those living with the condition that they have a support network and teach them how to best manage it,” said Dr. Walid El Dahi, head of KDS. “Let me take this opportunity to thank all our partners joining hands in this campaign starting with Kuwait Ministry of Health, participating hospitals and our media partners Al Anba and Al Jarida newspapers”. “50% of diabetics are susceptible to DPN nerve disease, so the campaign is directed to diabetes patients as a mirror reflecting our support of the Kuwaiti society. It is important for diabetic patients to always examine their legs and feet to avoid or lower the risk of any disease.” Said Dr. Tanheed El Hagery, Diabetes specialist in Mubarak Al-Kabeer Hospital. In addition to the outreach program and engagement exercises across health centers, “Qadam Bela Alam” involves an active social media campaign to reach diabetics and their surroundings and inform them of the risks and ways of management. This is to add more convenience to patients and those who want to support the campaign and help raise awareness and save diabetics foot around us.